Tabs can be pushed to a related popup while retaining their default behavior. The default number of list items in the popup is 7. It can be changed with the yCount parameter. If there are more items in the popup, scroll will appear. By default list items feature the #value# template. A different template can be set by the popupTemplate property. 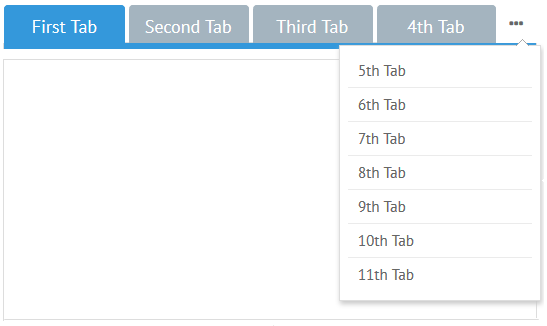 Note that options config for tabbar must include the value property, otherwise it will render id on tabs and throw an error. Still, there can be other properties rendered in a popup list with popupTemplate. More info about Webix data templates can be found in the dedicated documentation article.